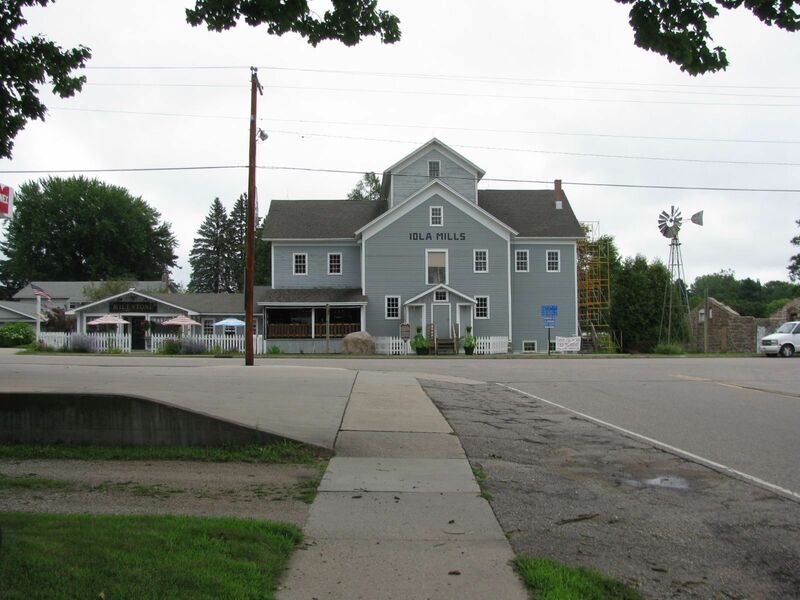 According to the current owner's website, the Iola Mills property story began in 1854 when the first property owner, Silas Miller dammed the river to power a sawmill. Miller died in 1855, and the mill went through several owners before 1866 when Henry Wipf and his two sons, Jacob and Conrad took over. The Wipf family and their descendants continued to own and operate the mills for the next 100 years. The adjoining historical marker says Silas Miller was also affiliated with one J.W. Chandler and the town was called "Chandler's Mills." At one time, a railroad siding served the mill. The Wipfs installed an Edison alternator about 1898 to generate electricity for the mill, current owners have restored the ability to generate power. The last of the Wipf family to operate the mill was Frederick J. Wipf. The sawmill was demolished in 1930 but he continued feed mill operations until 1963. The Millstone of Iola Mills - The official website of The Millstone, with history and historical photographs of the mill along with modern amenities.